This week, two of the Student Ambassadors at our Miami English School are demonstrating this week’s idiom: “Hitting The Books”. Obviously, the idiom isn’t as violent as a direct translation would make it sound. Neither Minji nor Vanessa is getting violent with any of their books, and neither of them are shaking with anger, either. 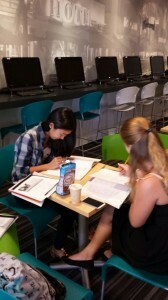 Saying that Minji and Vanessa are hitting the books is simply to say that they are studying very hard. In this case, they are preparing for their upcoming Cambridge exams (just around the corner in early December!). When students (in any kind of school or class) don’t hit the books, it is difficult to expect any kind of improvement. So, take a cue from Minji and Vanessa — HIT THOSE BOOKS! !